William Penn first appointed his cousin, Captain William Crispin, of the British Navy, as one of the Commissioners and Surveyor for his new province in Pennsylvania. However, in the fall of 1681, taking a southern route across the Atlantic Ocean, his ship stopped at Barbados, where Captain Crispin died. In April 1682, the ship "Amity" set sail from England. On board was Thomas Holme. Holme was born in Yorkshire, England, in 1624, and served as Captain in Lord Cromwell's army during the English Civil war. William Penn had appointed Holme, in Captain Crispin's place as Surveyor-General. He was also a member of Pennsylvania's first Assembly in 1682, and it’s Provincial Council, 1683-86. Under Penn's direction, Holme laid out the original portion of Philadelphia. He drafted the first map of the city, 1683, and a map of the settled parts of Pennsylvania, 1687. 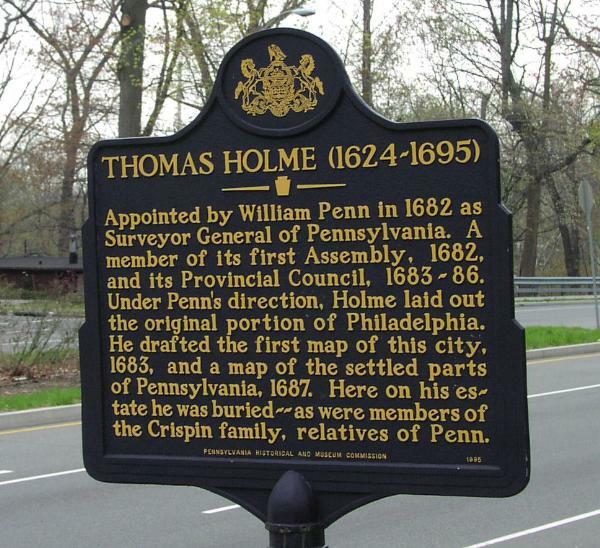 Penn granted to Thomas Holme 1,646 acres of land to which Holme added additional parcels and had a home in the city at Front and Arch Streets. He located his country home at the farm which he called "Wellspring", on the Pennypack, near the center of his initial grant. He laid off a piece of ground for a cemetery northwest of his house on a slight rise of ground. He was buried there at his death at age 71 in the spring of 1695. A Pennsylvania State Historical Marker identifies the site at 3000 Holme Avenue. Thomas Holme's will set aside £4 to be used "for some charitable purpose in Dublin Township, either a school or putting out the child of some honest man, that was poor, to a trade, or some honest way of livelihood." The bequest was not carried out until 1723, when the Wellspring estate was being divided after the death of Holme's daughter. An acre and a half was set aside for the construction of a log schoolhouse. By 1794, the log structure was no longer adequate and the trustees of the school were incorporated under the title of "The Trustees of the Lower Dublin Academy". Subsequently, the Trustees began to raise money through subscription and a public lottery authorized by Governor Edward Shippen. In the July 9, 1800 edition of The Pennsylvania Gazette, it was reported that the Academy had been incorporated and endowed under the authority of the legislature of the Commonwealth of Pennsylvania. The building cost $5,154.21, and was completed in 1802. Some of the lumber was sawed at the mills near by on the Pennypack Creek, including the Rowland Shovel Factory, and the stone came from a quarry a little further down the creek. Mr. Duffield was a famous Revolutionary era clock maker. His shop at Second and Arch Streets displayed a large clock above the front of his store and he donated the clock to the Academy. It had an old cannon ball, weighing 30 pounds, for a weight, and remained in use for many years. It was placed in a round dormer window opened especially for it with a clock dial painted white with large black numbers. When the property was sold the Trustees kept the clock but over the years it was paced in storage and forgotten. The round clock window still exists today and the clock may lie, unrecognized, under the dust in a local resident's attic. In 1855 (one source says 1842) the Academy property was leased to the Controllers of the Public Schools of the First School District of Pennsylvania and named Thomas Holme School. In 1901 the property was sold to the City and continued to function as a public school until it was closed in 1925 and put up for sale. Students were spread around to other local schools until a modern facility was built in 1952. The old Academy property then served as a private residence until the 1990's when it became vacant. Subsequently, a local law firm bought the property and invested a large amount of money in renovating the building to use as professional offices. In 2006 the structure suffered major damage as the result of arson. Through the centuries, thousands of students were educated within the walls of the LowerDublin Academy . One of the most famous was Stephen Decatur, Jr. (1779 - 1820). Commodore Decatur was born in Northeast Philadelphia and went on to become an American naval officer notable for his heroism in the Barbary Wars and in the War of 1812. He was the youngest man to reach the rank of captain in the history of the United States Navy, and the first American celebrated as a national military hero who had not played a role in the American Revolution. Also of note was Thomas Hill (1818-1891), an American educator and Unitarian clergyman, in 1859 he was appointed president of Antioch College and then president of Harvard University in 1862.